Both formative and summative assessments/evaluations are directly determined by evidence gathered from the educator and the evaluator, including submitted artifacts and classroom observations. The evidence collected is used to determine the educator’s level of proficiency in each of the four Standards of Effective Teaching, as well as the educator’s progress toward achieving their Student Learning and Professional Practice goals. 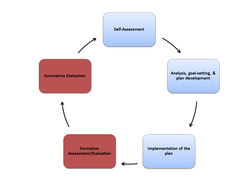 Educators on any other plan will receive a formative assessment at some point midway in the plan, and a summative evaluation at the end of the cycle. Educators may reply in writing to the assessment/evaluation within five school days of receiving the report. Educators are responsible for submitting artifacts at least two weeks prior to a formative assessment/evaluation delivery date and at least four weeks prior to a summative evaluation delivery date in order to ensure evaluators have sufficient time to review the artifacts as a part of the educator's evaluation. The document below will allow you to see what a formative assessment looks like on the Educator Development and Feedback System website.